Does it really seem that far away? In virtually every business, there is where you are now, and there is where you want to be. Click here for a free report outlining our step-by-step method for developing an extensive network of clients, customers, and referral sources without ever having to sell again. 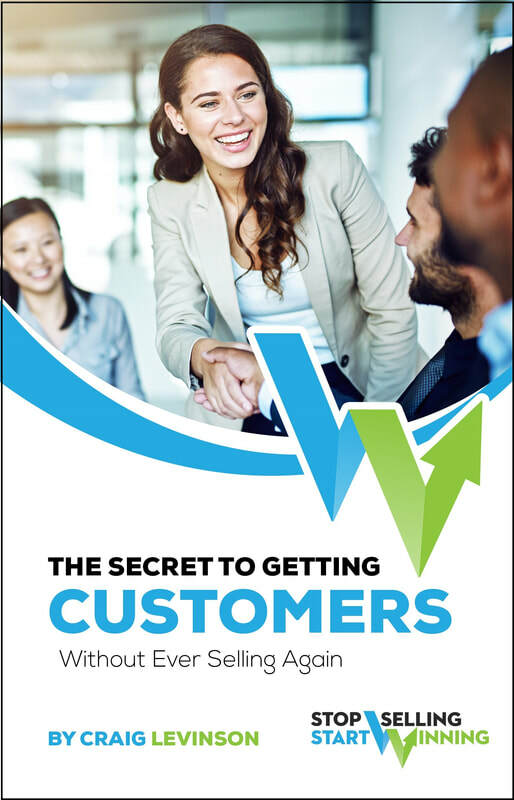 Our ebook, Stop Selling Start Winning, which details each aspect of our process and includes every email template and "anti-sales call" script you need, is available here for purchase with a limited time 50% discount. "As the Managing Partner of Brown Raysman Millstein Felder & Steiner (then an AmLaw 200 national law firm), I needed to find a marketing professional to motivate and direct the efforts of our partners in offices across the United States. Craig and his team introduced his sales training process, designed specifically for professional services, to my somewhat skeptical partners. We started with a small pilot group of lawyers. After just one year, the handful of participating attorneys added $2 million in new revenues to the firm’s income. It was a significant return on investment which attracted attention within the partnership. This initial success was followed by another training group. After year two, the combined training classes were contributing over $6 million in new revenues, and a broad group of new clients, to our law firm. One of my partners had been pursuing work from a major big box retailer for over a decade without success. With Craig’s guidance, the lawyer succeeded in finally landing the client, and subsequently contributed $600,000 in annual revenues from new real estate transactional work. Even the most senior and experienced partners, including myself, benefited from the invaluable techniques and tactics we learned from Craig’s sales training process. He has the ability to help every professional gain self-confidence and become a marketing star." "In my experience, most lawyers really struggle with marketing their practices and bringing in clients. Craig was very helpful in substantially increasing my book of business in just over a year. And while his method was built for introverted attorneys who despise the idea of selling their services, it's also effective for someone in my position at the time: a relatively new partner with a book of business, but who wanted to increase that book in order to provide for my family and increase my job security. I've worked with other sales and marketing directors at some of the largest firms in the country. The BIG difference between Craig and his peers is that he gave me actual, sensible processes which I liked doing (and continue doing today), which the clients liked receiving, that cost almost nothing, and that started paying dividends almost immediately. Using Craig's "Expanding Your Network From Your Desk" process, I quickly grew a heavy duty network of over 150 new prospective real estate/transactional clients (retailers, developers, private equity sources, etc. ), and referral sources, while simultaneously increasing my knowledge of the trends impacting real estate. ​I would recommend Craig in a heartbeat -- and not just to lawyers. Any accountant, doctor, or salesperson, in general, would benefit greatly from his coaching." We are motivated to empower individuals and organizations to unlock their potential. That's what gets us out of bed in the morning -- the desire to help people quickly, inexpensively, and efficiently bridge the chasm between imagining their goals and actually achieving them. We were like many of you - introverted, intuitive thinkers, who shied away from sales (or marketing) because it felt distasteful. Instead of engaging in a process we detested, we created a way to develop clients without selling -- a process that is comfortable for the providers and welcomed by the prospects. • An "anti-sales" sales process, so you never again have to convince, or persuade, or say: "Hire me!" • A targeted approach to networking that you can undertake without leaving your desk -- allowing you to stop attending events that rarely bear any fruit. • Marketing tactics for attracting prospective clients in your sleep. • Professionals, professional services firms, and product companies that need to develop clients, but don't have comfortable, repeatable processes for making that happen (or that need support for their existing marketing or sales departments). • Nonprofits requiring novel streams of funding (e.g. joint ventures with for-profits), and modern business development tactics infused into their fundraising.